This new release works with Lion and Mountain Lion, not tested on Snow Leopard. Python is still 2.7.x cause many libraries are using Python 2.7 (not yet Python 3.3). But users, let me know if Python should be better for you. PicTRO for Windows 8 just pass 4000 downloads. The new release improve user experience with new features which allow user to personalize his interface. Add pictures to your favorites and find them in the new mosaic on the Hub. Pin your favorites categories to the Windows Start Screen. Hope you will enjoy this new release, and thank you for downloading ! 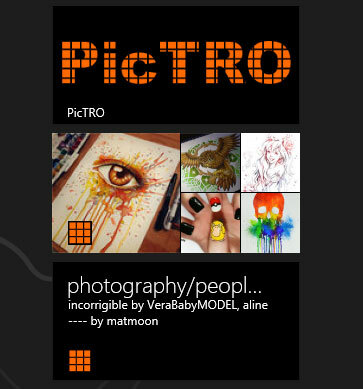 PicTRO is a new app for Windows 8. 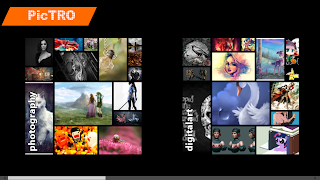 You can found it on the Windows Store right now. 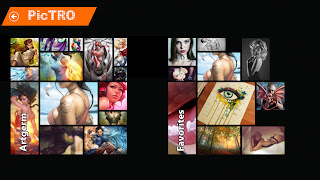 PicTRO allows you to browse beautiful pictures in galleries from DeviantArt. 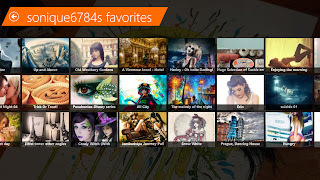 Share photography with your friends by mail, twitter, facebook... Found beautiful images with search engine. Discover an amazing universe and lost you in artist sights.